The rise of South Africa's Economic Freedom Fighters party, and its leader, speaks volumes, says Richard Swift. The rise of Julius Malema and his Economic Freedom Fighters party (EFF) speaks to the desperation of poor South Africans who continue to live under economic apartheid long after the political variant left the scene. 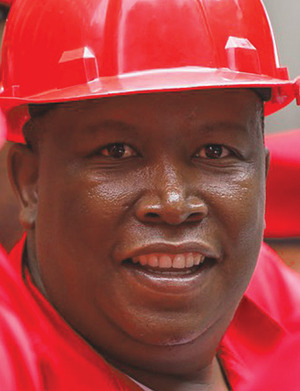 Malema is a recognizable type in South African politics – a fire-breathing populist who combines ‘concern’ for the poor with a big ego and a penchant for feathering his own nest. Malema started his political career in the African National Congress (ANC) youth wing, but his talent for courting controversy – championing the author­i­tarianism of Zimbabwe’s Robert Mugabe and attacking journalists critical of his own limo lifestyle – got him expelled. Malema has been able to maintain a certain popularity. His newly formed EFF won 25 seats in the 2014 elections, largely by pointing out the ANC’s complicity in such issues as the massacre of striking miners and its general support for the priorities of corporate South Africa. Yet while Malema has called for the nationalization of mines, his own fortune has been connected to the outsourcing of public services in his native Limpopo. And he is currently under investigation for fraud, corruption, money-laundering and tax evasion. Still, it would be a mistake to see Malema as simply a hypocrite. He has proved an effective parliamentarian, holding President Zuma to account for everything from corruption to the xenophobic riots against migrants that periodically erupt in the country. Can poor South Africans find a way to move beyond this charismatic lightning-rod to build a popular alternative to an increasingly out-of-touch ANC? Our independent global journalism is entirely subscriber-funded. Subscribe for instant access to our 8-year archive of award-winning magazines.